Eberle 1890/16. Signed and dated lower right. 41 x 60,1 cm (16,1 x 23,6 in). 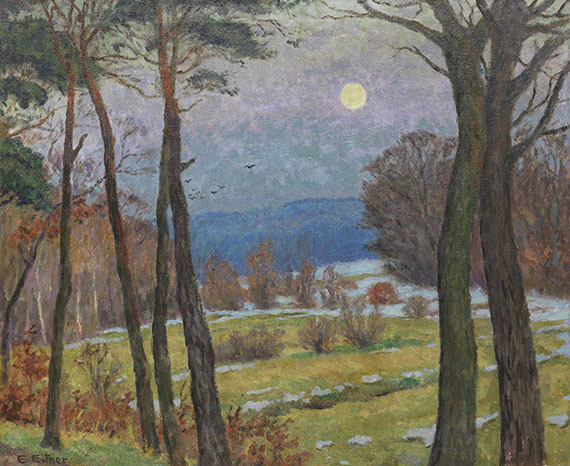 PROVENANCE: Georg Kohn, Breslau (1914,1923). 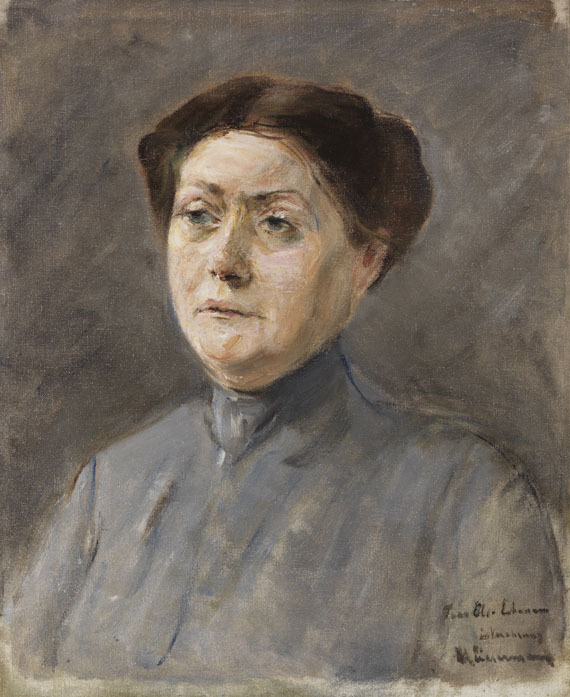 LITERATURE: Erich Hancke, Max Liebermann. 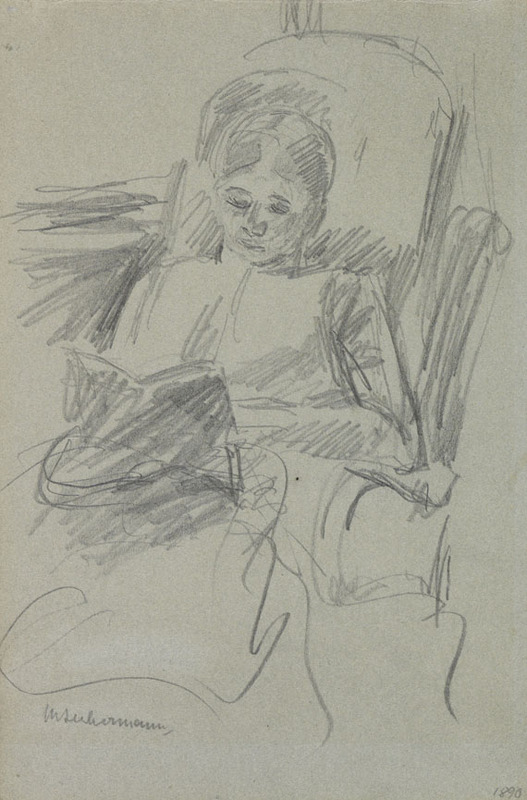 Sein Leben und seine Werke, Berlin 1914, work index p. 535 (with illu. on p. 256). 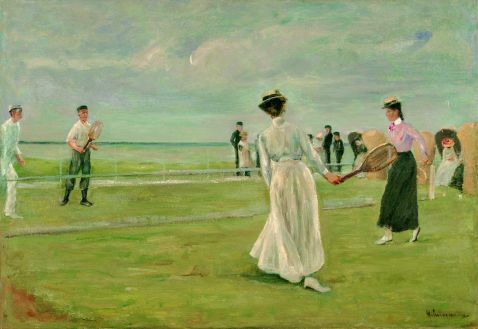 Idem, Max Liebermann. Sein Leben und seine Werke, 2nd slightly changed edition, Berlin 1923 (with illu. on p. 256). 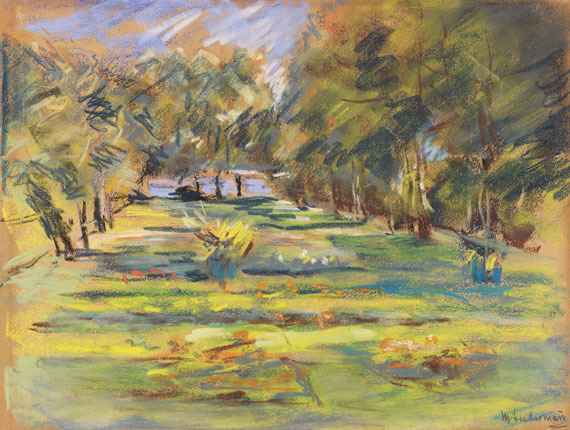 Holly Prentiss Richardson, Landscape in the work of Max Liebermann, Phil Diss. Brown University, Ann Arbor 1991, vol. II, p. 67, no. 163. 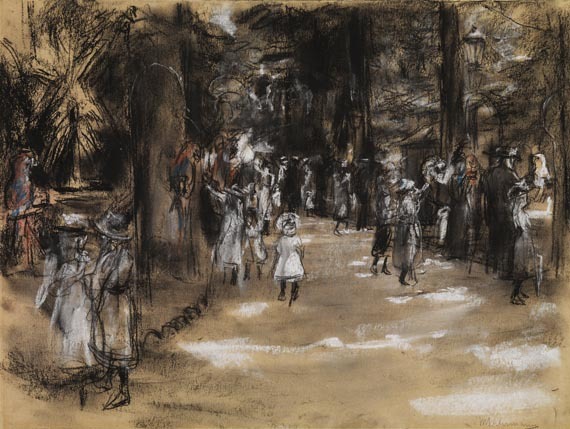 Max Liebermann began capturing his immediate environment on paper at the age of nine. 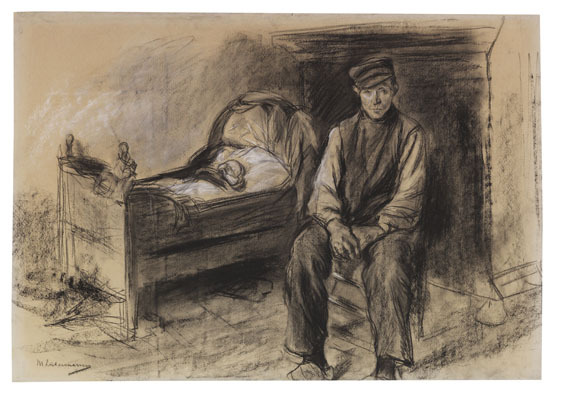 When the renowned Berlin painter Carl Steffeck saw drawings by the fifteen-year-old he recommended that the boy's talent should be encouraged as much as possible - much against his parents ideas. 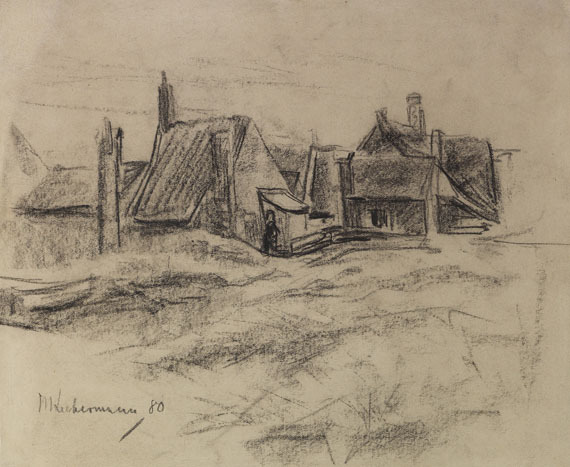 Steffeck gave Liebermann his first drawing lessons and encouraged him to attend the Weimar Akademie. 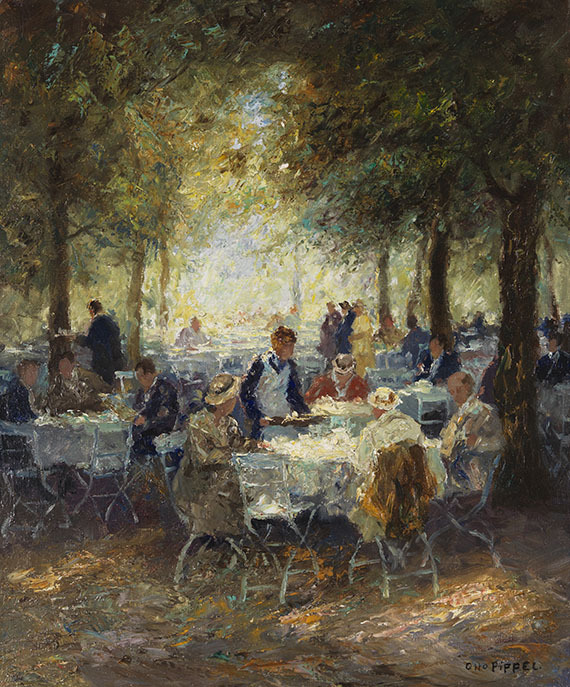 Liebermann studied in Weimar for three years until 1872. 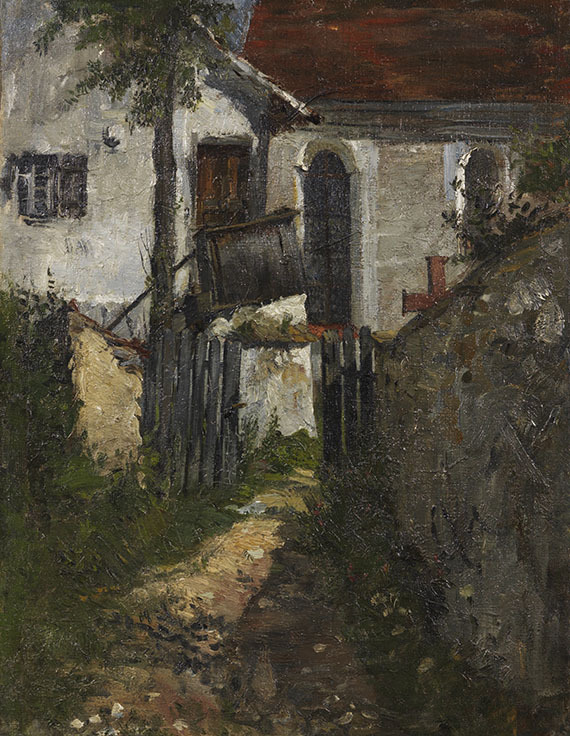 A trip to Düsseldorf in 1871 took the young artist to Mihály Munkácsy, a Hungarian painter who lived here. 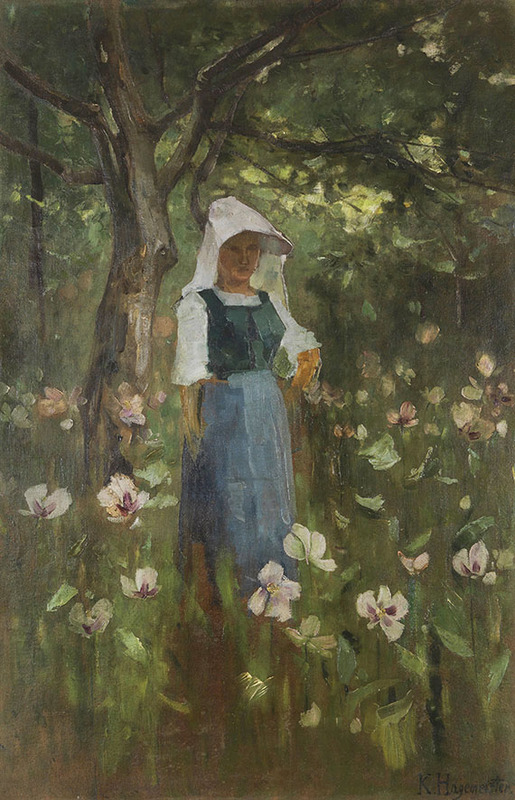 Liebermann was inspired by Munkácsy's Realism. 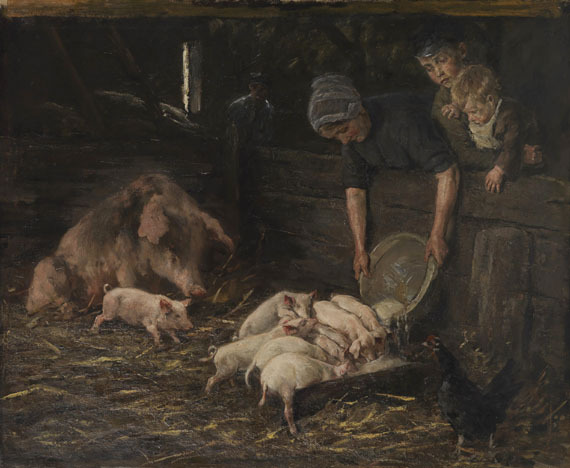 Still under this impression, Liebermann painted his first large painting, 'Die Gänserupferinnen' (Girls plucking Geese). 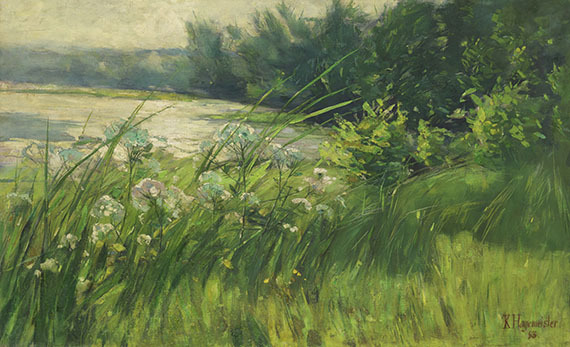 The unadulterated realism of this work, which was much rejected among the critics, was to become typical of Liebermann's art. 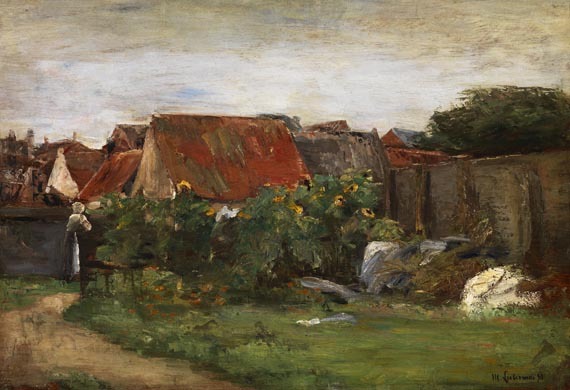 He spent the years 1873 to 1878 in Paris and the artist colony of Barbizon. Here he studied the art of Millet, whose paintings of farm workers had a strong influence on him. 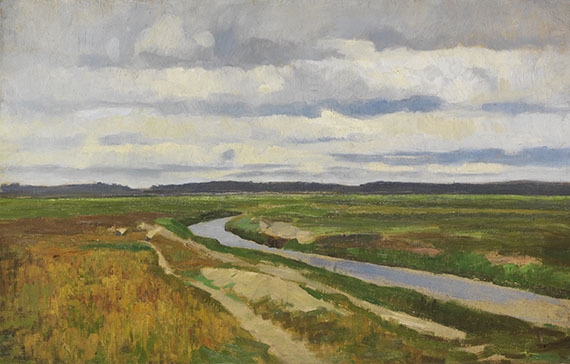 A first sojourn in Holland in 1871 was followed by regular trips to the Netherlands, where he discovered suitable motifs for his most important works. 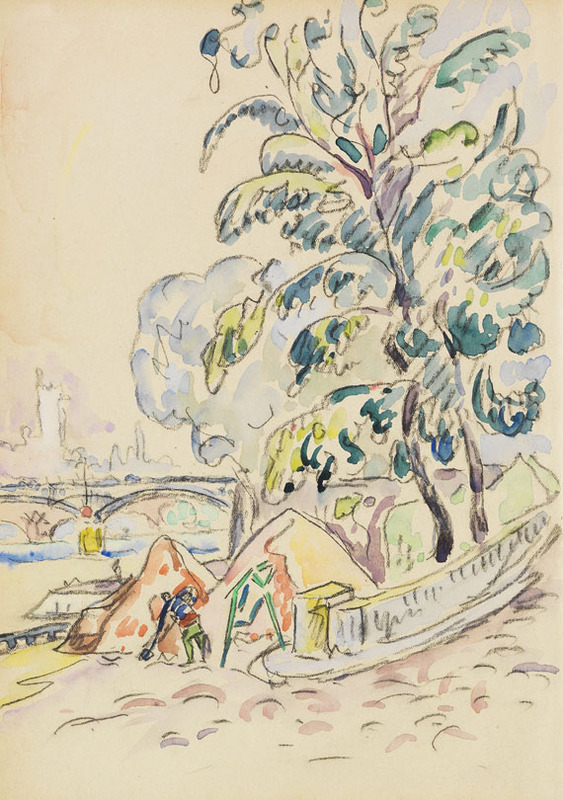 His striving to elevate the life and work of the simple man to the realms of art in an unpretentious simplicity was not generally accepted. 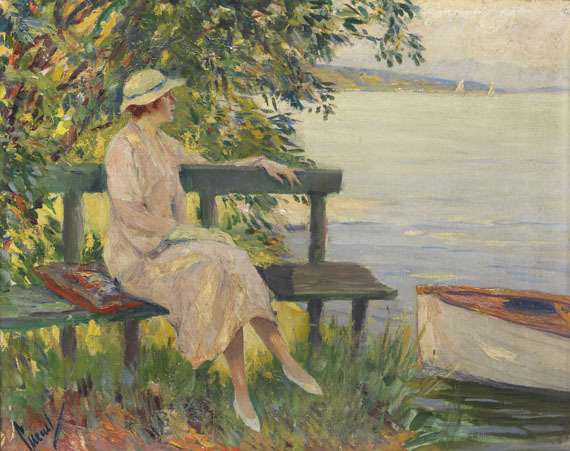 Liebermann continually fought for acceptance. 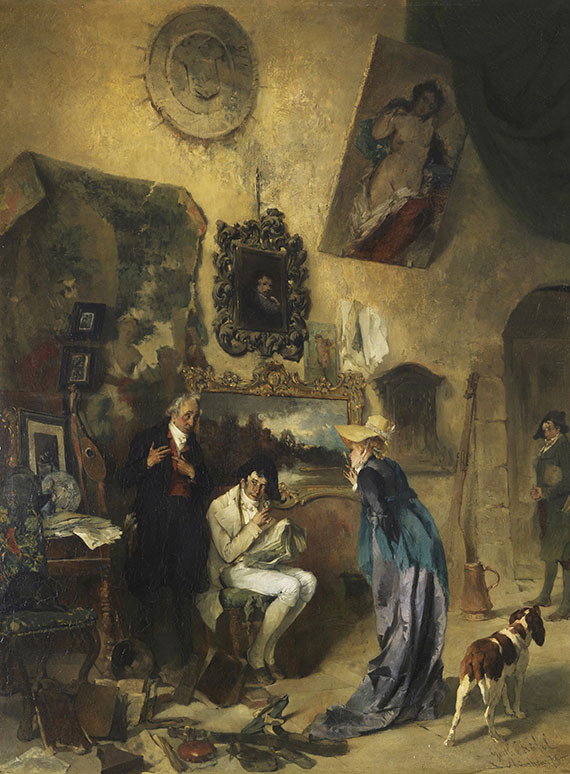 Only after turning towards motifs and scenes of bourgeois life did he become the celebrated and sought after painter of the liberal bourgeoisie of the turn of the century. 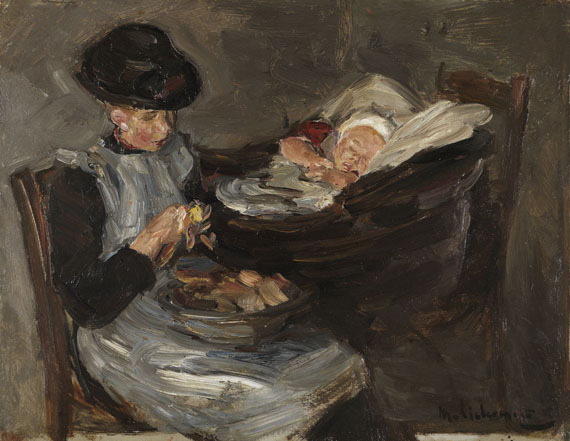 As it is so often the case with Max Liebermann, an unspectacular subject is turned into an artistic delicacy. 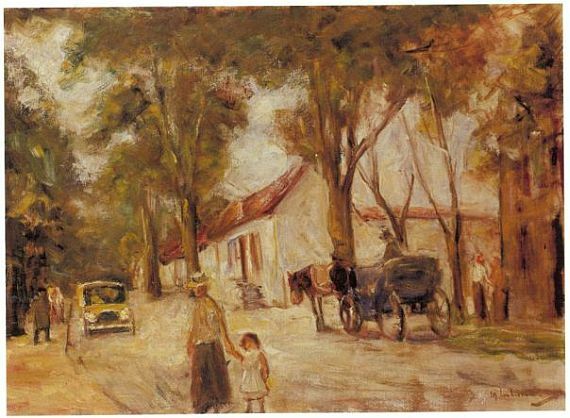 Matthias Eberle, author of the catalog raisonné of paintings by Max Liebermann, sees the village landscape under a "conceivably non-representative Point de vue", and yet, the result is a "an enchanting study" (Matthias Eberle, Max Liebermann 1847-1935. 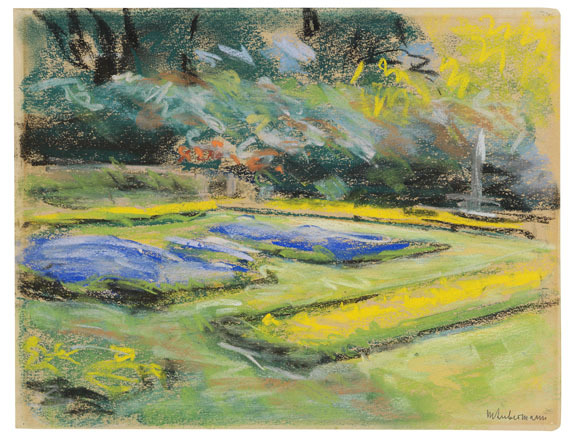 Catalog raisonné of paintings and oil studies, Munich 1995, vol. 1, p. 370). 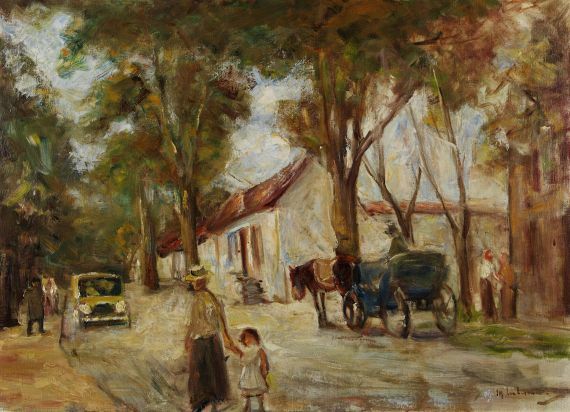 Max Liebermann‘s preference for simple rural motifs, which originates from his stays in the Netherlands is widely known and earned him criticism from the educated elite in Germany. However, what remains are his artistic achievements that are unmatched. 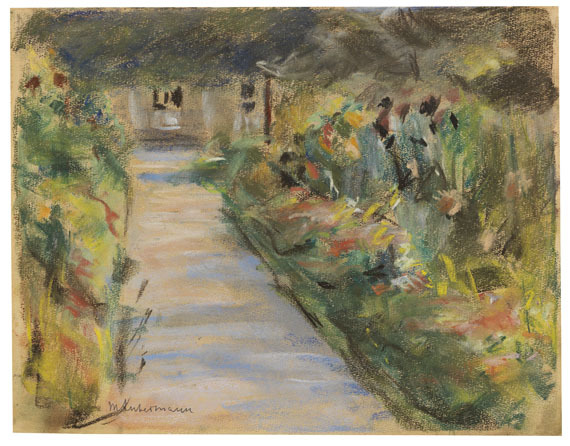 It is not about what Liebermann depicts, but rather how he illustrates the else unspectacular scene, in which even the compost pile behind the wall is a scenic event. The swift application of the paint may be deceiving, as there is much more artistic calculation involved here. 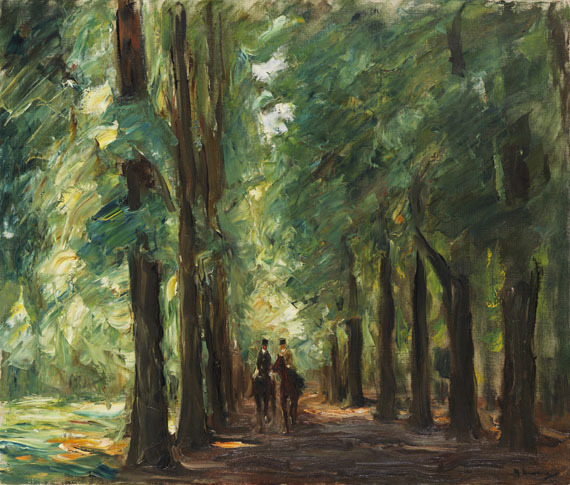 The subtle color values are well balanced and add freshness and the discretion of the overall expression that is so characteristic of Max Liebermann to the work. 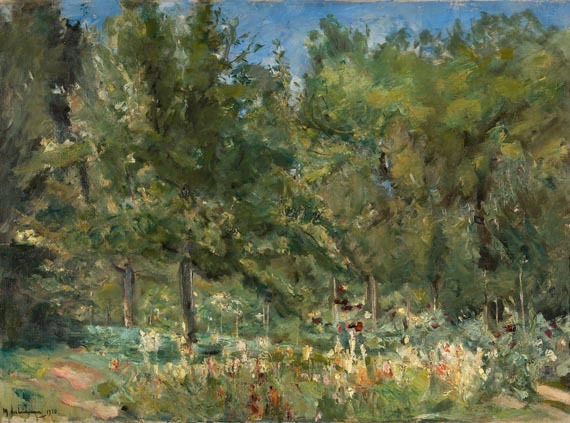 Liebermann ennobled the subject in a rather non-pathetic sense by applying all his artistic talent, in order to attain his very own expression. 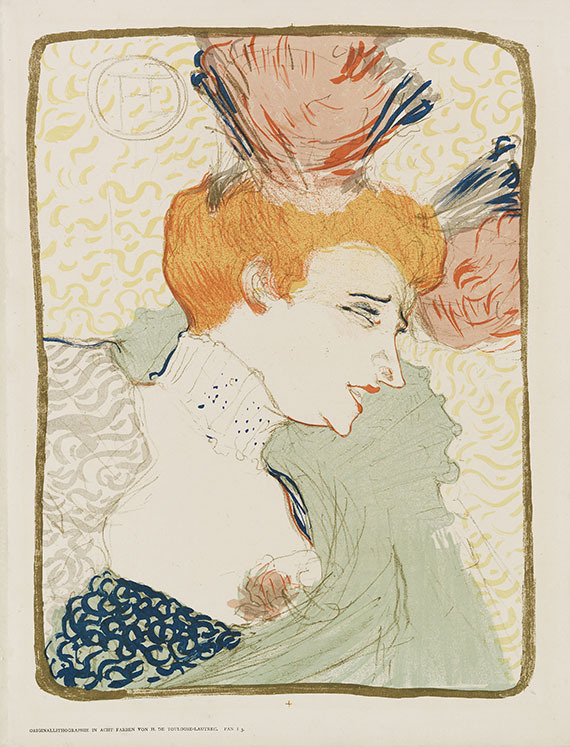 He spent the years 1878 to 1884 in Munich and then returned to his native town Berlin in 1884. 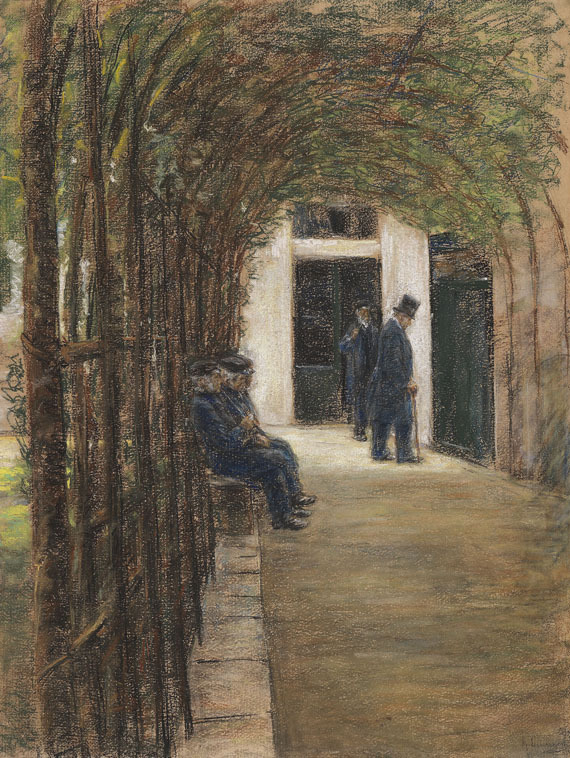 Liebermann was an important personality not only as an artist but also as an art politician. At the beginning of 1892 he was a member of the 'Erste Sezession Deutschland', an organization which he chaired in Berlin from 1898 to 1911. 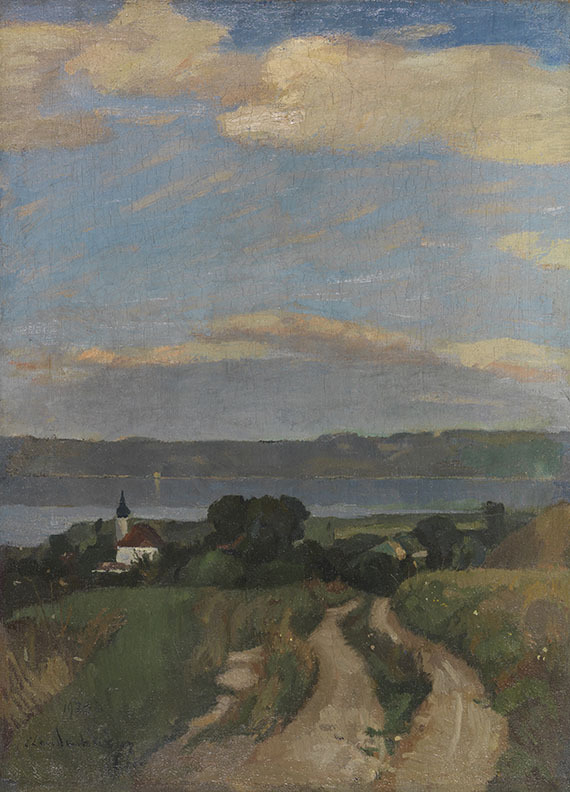 His home town honored Liebermann by appointing him professor at the Königliche Akademie der Künste. Later, from 1920 to 1932, he was the president of the Preußische Akademie der Künste. 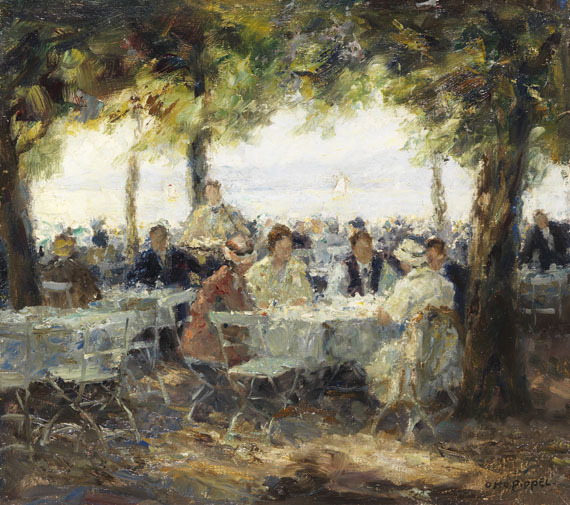 Liebermann retreated from the political world in the last years of his life. He became severely ill in 1934 and died three months later in isolation in his Berlin apartment [KD].